A homemade gift is priceless, but it doesn’t have to be expensive. Delight your loved ones with a colorful bouquet of sweet edible treats – it’s a delicious way to brighten anyone’s day! In addition, cookie bouquets make stunning centerpieces and put the icing on the cake for any event. 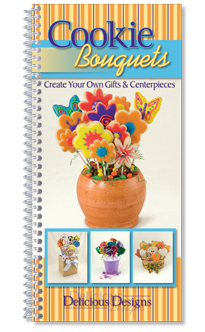 This book includes full-color photos and step-by-step instructions to help you create your own sweet cookie bouquets – a gift that is easy-to-make, inexpensive, unique and practical!